African Networks Strand 3 Networks and Neighbourhood Building 11/18/08 Cassandra Ellerbe-Dück. 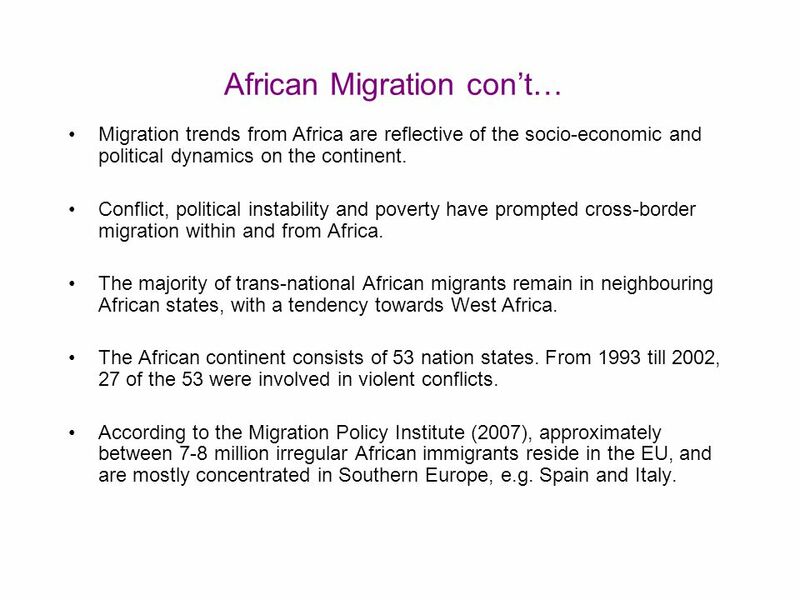 3 African Migration con’t… Migration trends from Africa are reflective of the socio-economic and political dynamics on the continent. Conflict, political instability and poverty have prompted cross-border migration within and from Africa. The majority of trans-national African migrants remain in neighbouring African states, with a tendency towards West Africa. The African continent consists of 53 nation states. From 1993 till 2002, 27 of the 53 were involved in violent conflicts. 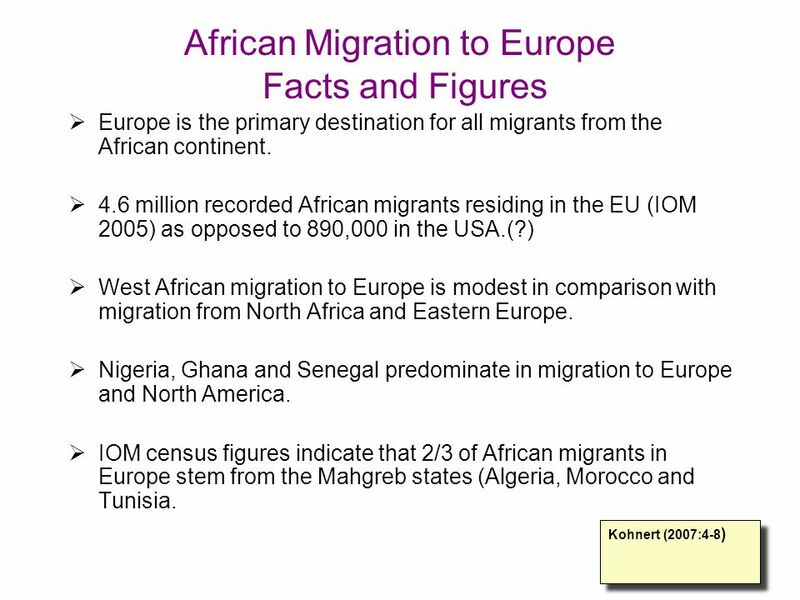 According to the Migration Policy Institute (2007), approximately between 7-8 million irregular African immigrants reside in the EU, and are mostly concentrated in Southern Europe, e.g. Spain and Italy. 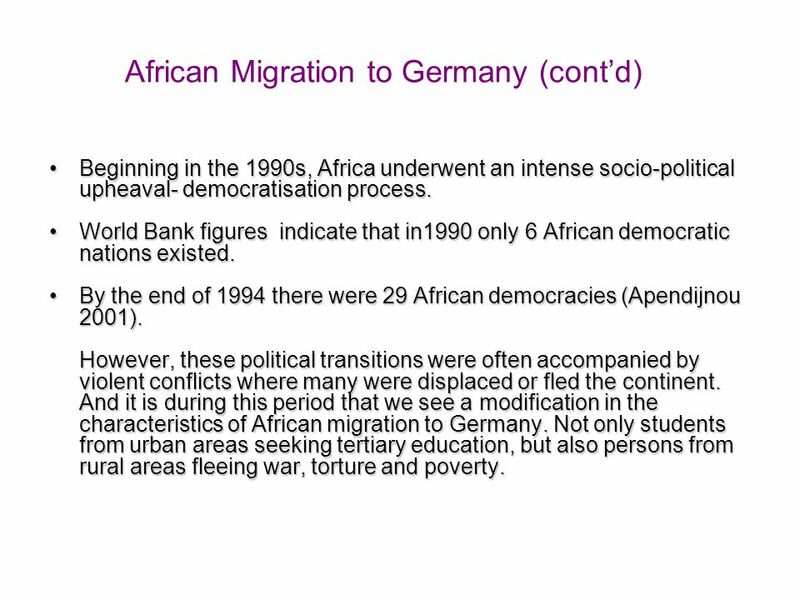 4 African Migration to Germany Since the 1980s a steady, but increased flow of Sub- Saharan African migrants to Germany. Migration trajectories of Africans is as diverse as the continent. Stringent immigration legislation and the reinforcement of EU borders (solid/fluid) has made entry for Africans increasingly difficult. 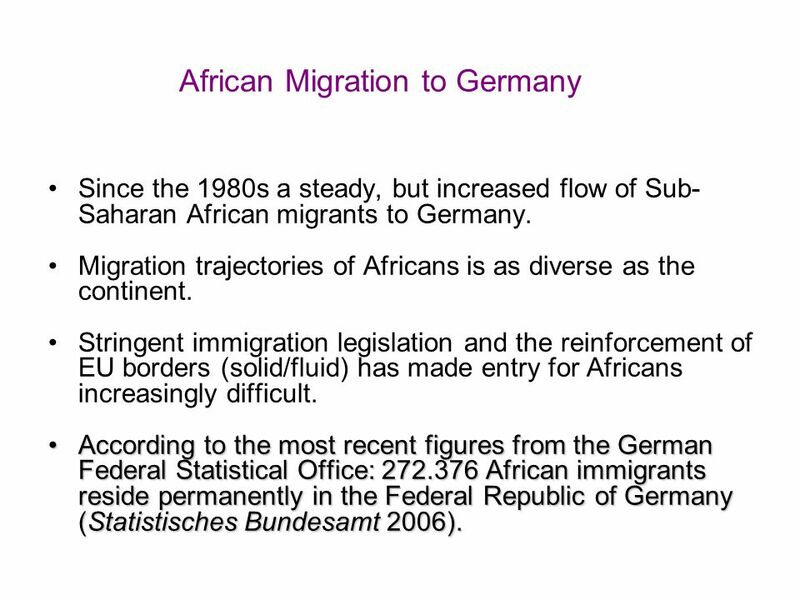 According to the most recent figures from the German Federal Statistical Office: 272.376 African immigrants reside permanently in the Federal Republic of Germany (Statistisches Bundesamt 2006).According to the most recent figures from the German Federal Statistical Office: 272.376 African immigrants reside permanently in the Federal Republic of Germany (Statistisches Bundesamt 2006). 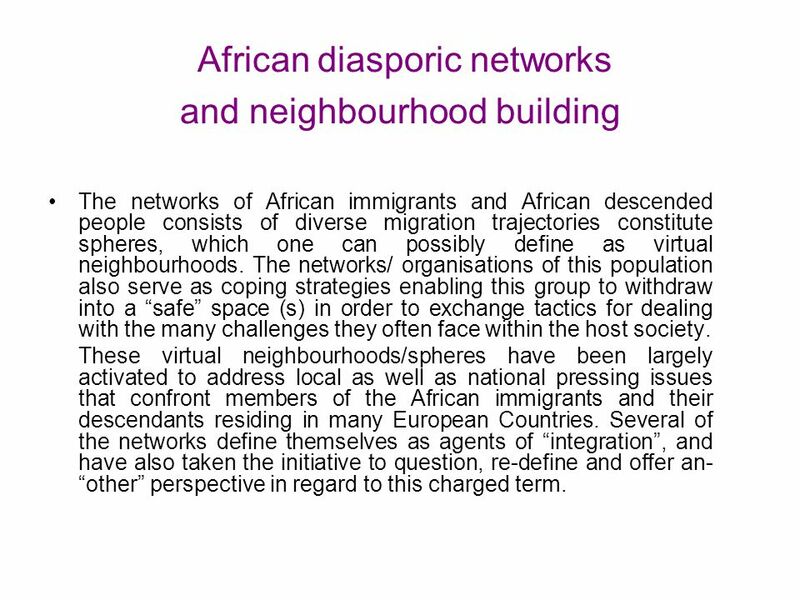 6 African diasporic networks and neighbourhood building The networks of African immigrants and African descended people consists of diverse migration trajectories constitute spheres, which one can possibly define as virtual neighbourhoods. The networks/ organisations of this population also serve as coping strategies enabling this group to withdraw into a “safe” space (s) in order to exchange tactics for dealing with the many challenges they often face within the host society. These virtual neighbourhoods/spheres have been largely activated to address local as well as national pressing issues that confront members of the African immigrants and their descendants residing in many European Countries. 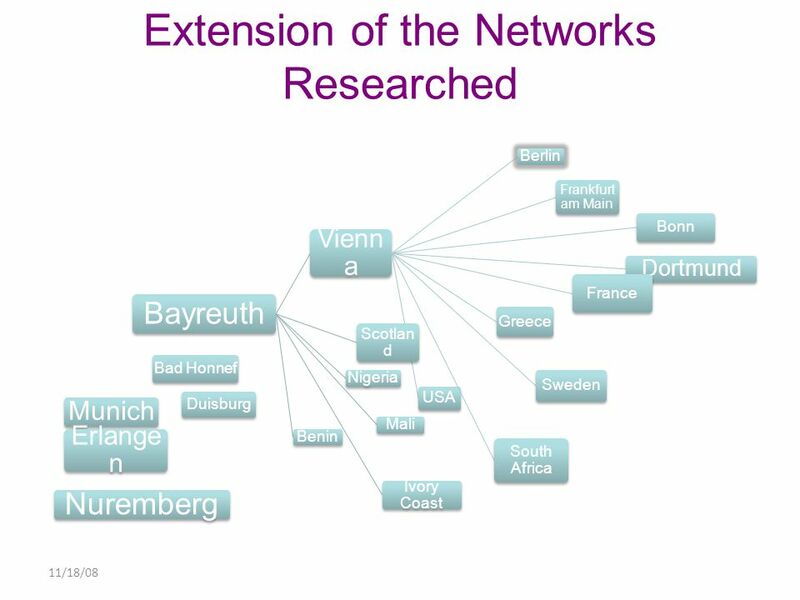 Several of the networks define themselves as agents of “integration”, and have also taken the initiative to question, re-define and offer an- “other” perspective in regard to this charged term. 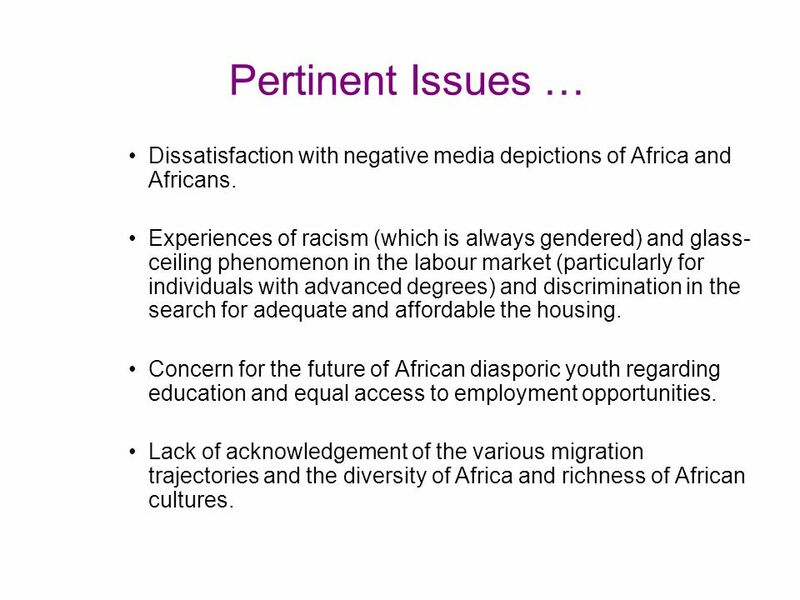 7 Pertinent Issues … Dissatisfaction with negative media depictions of Africa and Africans. Experiences of racism (which is always gendered) and glass- ceiling phenomenon in the labour market (particularly for individuals with advanced degrees) and discrimination in the search for adequate and affordable the housing. Concern for the future of African diasporic youth regarding education and equal access to employment opportunities. Lack of acknowledgement of the various migration trajectories and the diversity of Africa and richness of African cultures. 8 Lack of local and EU policies designed to deal with the collective fate of African migrants. 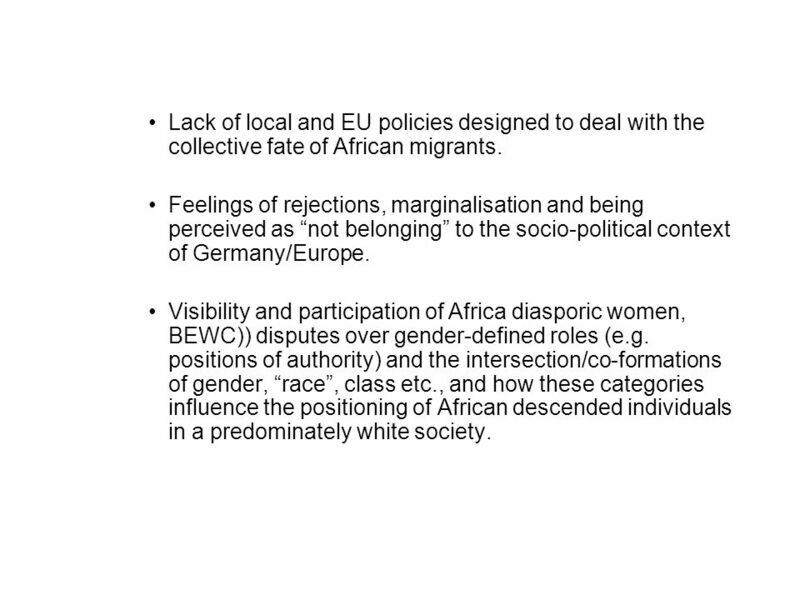 Feelings of rejections, marginalisation and being perceived as “not belonging” to the socio-political context of Germany/Europe. Visibility and participation of Africa diasporic women, BEWC)) disputes over gender-defined roles (e.g. positions of authority) and the intersection/co-formations of gender, “race”, class etc., and how these categories influence the positioning of African descended individuals in a predominately white society. 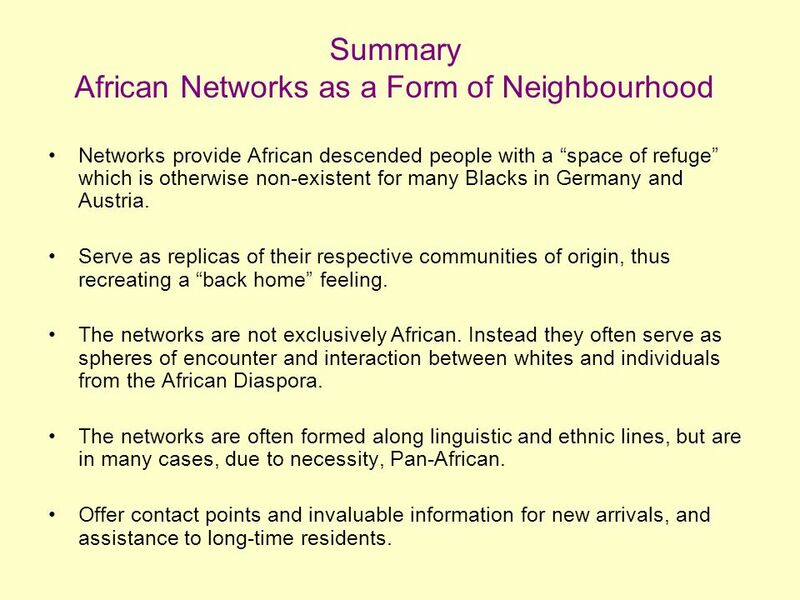 11 Summary African Networks as a Form of Neighbourhood Networks provide African descended people with a “space of refuge” which is otherwise non-existent for many Blacks in Germany and Austria. Serve as replicas of their respective communities of origin, thus recreating a “back home” feeling. 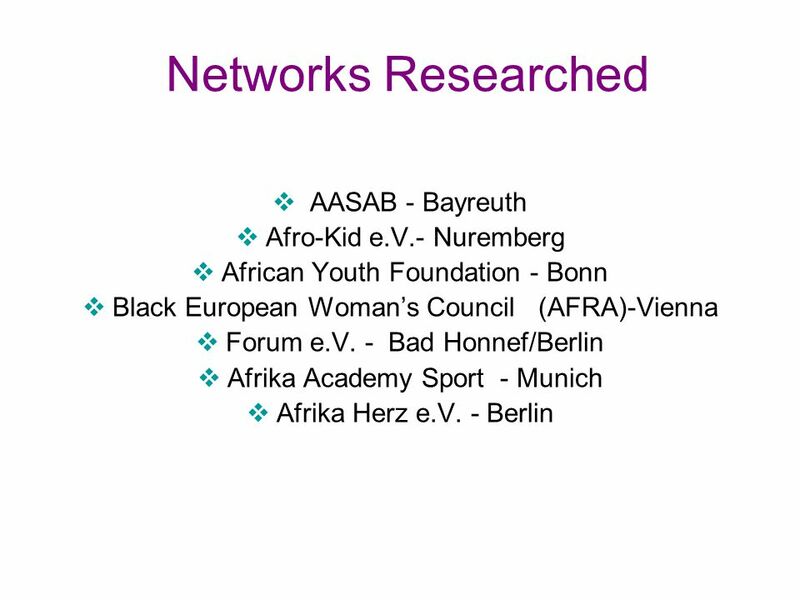 The networks are not exclusively African. Instead they often serve as spheres of encounter and interaction between whites and individuals from the African Diaspora. The networks are often formed along linguistic and ethnic lines, but are in many cases, due to necessity, Pan-African. Offer contact points and invaluable information for new arrivals, and assistance to long-time residents. 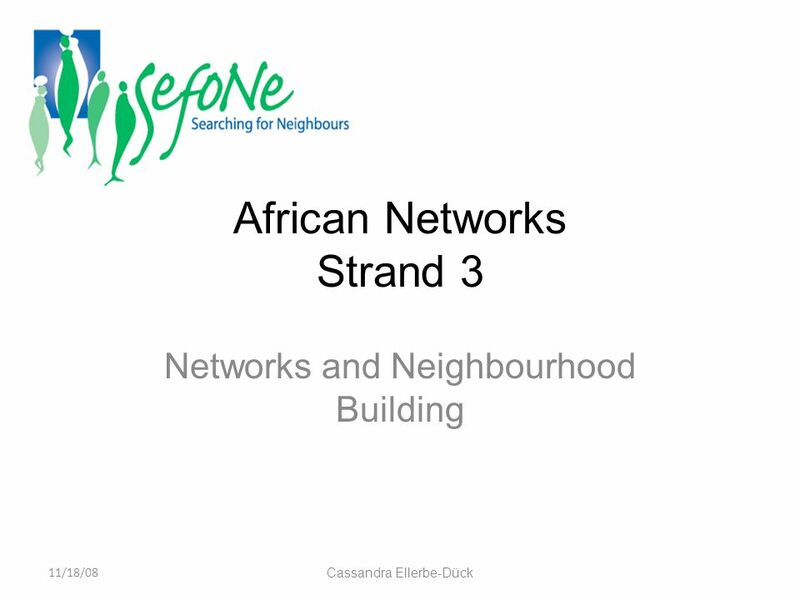 Download ppt "African Networks Strand 3 Networks and Neighbourhood Building 11/18/08 Cassandra Ellerbe-Dück." GeMIC by numbers 8 countries 3 concepts 3 methodological approaches 3 phases 6 thematic areas. EU Sport Forum | Cyprus, 19 September 2012 Sallie Barker and Heidi Pekkola – ENGSO “Creating a Level Playing Field” ENGSO EU-Project Social Inclusion of. Churches’Commission for Migrants in Europe MIRACLE Project 3-5 May 2010 Brussels Adrian Cristea. European experience with migration and integration problems: Ways for overcoming xenophobia and extremism ELDR&YABLOKO International Conference Youth under. INTER-ACTION: CANADA’S NEW MULTICULTURALISM GRANTS AND CONTRIBUTIONS PROGRAM. Importance of inclusion of immigrants in civic and societal life of hosting EU countries. University ”Ss Cyril and Methodius” in Skopje INSTITUTE OF ECONOMICS Emigration of Macedonia to Switzerland – changes and current situation Verica Janeska. Children on the move: opportunities and risks. MIGRANT INTEGRATION. Table of contents Who is IOM? Migration Integration The image makers.